After my first experiment I decided to make a bigger quilt that would actually be of use. 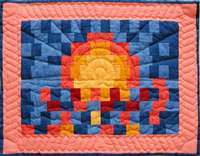 The quilt features a large baby blocks motif. Each side of the blocks has an animal pattern quilted onto it, hence the name of the quilt. The back shows the quilt pattern more clearly. My very first quilt. After buying six Fat Quarters in primary colors from my Local Quilt Shop I came up with this design to fit the colors.